In the event that you need one or more Users to reset their password, you can send a password reset command to them via the WAVE portal. This will send an email to their registered email account. This will result in an error message if one or more of the accounts does not have an email address. Users will receive a password reset email providing them with a link to reset their password. 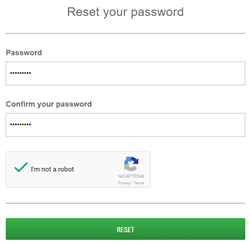 When they open the reset page, they do not need to validate their existing password, they only need to enter the new password, confirm it, and click the reset button. The following image shows the reset password page that opens when the User clicks the link sent to them via email. In the main menu click Users. The Users page appears with a list of available users (if any). Note: By default the first 25 Users will appear on the page. If you require operations on more Users, select the number of Users to display in the bottom right corner of the page. Operations you select will only affect the Users appearing on the page. In the left column next to the User, click the check box to select the User(s) to send a password reset. You may select any User appearing on the page. Click the check box next to Display Name to select all visible users. 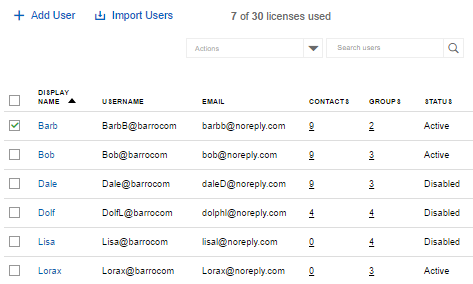 Once you have selected one or more users, the Actions menu appears at the top of the page. 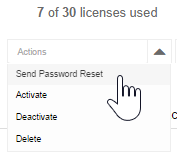 In the Actions menu, Click Send Password Reset. The Password Reset email is sent.